Crafted in classically elegant 9ct gold, this stylish 24 inch spiga chain is the ideal accessory for those who prefer understated glamour. Fully adjustable, this versatile piece is perfect for the woman who loves to personalise her look. 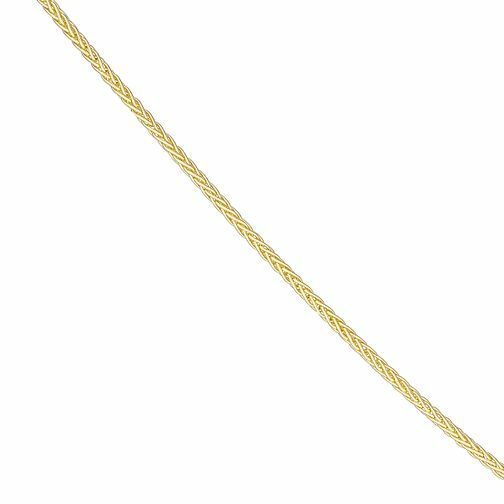 9ct gold adjustable 24 inch spiga chain is rated 5.0 out of 5 by 4. Rated 5 out of 5 by Anonymous from Great Quality and Offers Flexibility Bought this chain to keep my late husbands’ wedding band on with my rings, it’s a superb chain with adjustable length for different occasions. Our bands were purchased from Ernest Jones- it seemed fitting that the chain be the home for them! I’m very pleased with the lovely smoothness of the chain and it’s beautiful subtle colour! Rated 5 out of 5 by Anonymous from Lovely chain I have been looking for a small 24inch chain for a while and found it difficult to find one then I found this one at a very reasonable price and I can adjust it if I want to wear it shorter.